Scholastic Olympics Thank you to Ms. Drlik, our outstanding Spanish teacher, who took the eighth grade students to the Scholastic Olympics at Brother Rice and Marian this past Wednesday. St. Hugo had the most awards won at Marian. 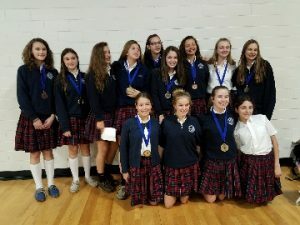 Congrats to the following winners: Marian competition: Catie New – gold medal (Sacraments), Anya Keena – gold medal (Science), Charlotte Mustion – gold medal (US History & Civics), Lauren St. Andre – silver medal (Algebra), Lauren Tuohy – silver medal (Computers), Bianca Giglio – bronze medal (Drawing), Ella Harris – bronze medal (Grammar), Grace VanNorwick – bronze medal (Reading Comprehension), Ania Petrosky – bronze medal (Spanish), Maria VanDieren – bronze medal (Theology Overview) and Kennedy Marsh – bronze medal (Vocabulary). Brother Rice competition: Bowen Waltz – bronze medal (Science), Zach Olah – bronze medal (Religion) and Jose Segura – bronze medal (Drawing). Great job to all of those students that competed! Conferences/Book Fair Conferences take place Wednesday, November 8 from 4:30pn-8:00pm and Thursday, November 9 from 4:30-8:00. The Sign-up Genius is in this Parent Bulletin. When you come to conferences please check out the Book Fair. All money that is raised from the Book Fair goes directly back to get more books and supplies for our library. Children are welcomed in the Book Fair only with adult supervision the evenings of conferences. We are providing babysitting drop off in the cafeteria for families who are in need. Thank you to Mrs. Thomas and Mrs. Hermann for organizing this year’s Book Fair. Box Tops Good news, our Box Tops drive has earned over $1100 for St. Hugo! Thank you to all the families and teachers that supported this fundraiser. Because of you, many new and needed supplies can be purchased for your children’s classrooms (dictionaries, pencil sharpeners, dry erase markers/boards and study folders). Also, congratulations to Mrs. Nagel’s class for sending in over 1000 Box Tops to become our champion and win the “Hugo Cup”! Job well done B2 and everyone! Athletics Claire Becker won the local skating competition in Plymouth this past weekend. She is competing with the synchronized skating team that will now compete in sectionals then nationals. Good luck Claire! Our Pink Day was a success! We raised over $1100 in support of the American Cancer Society. Thank you all for your generosity!